The final stop on the Summer of eLearning Tour kicked off today at Chesterton High School, just an hour down the road from Chicago. 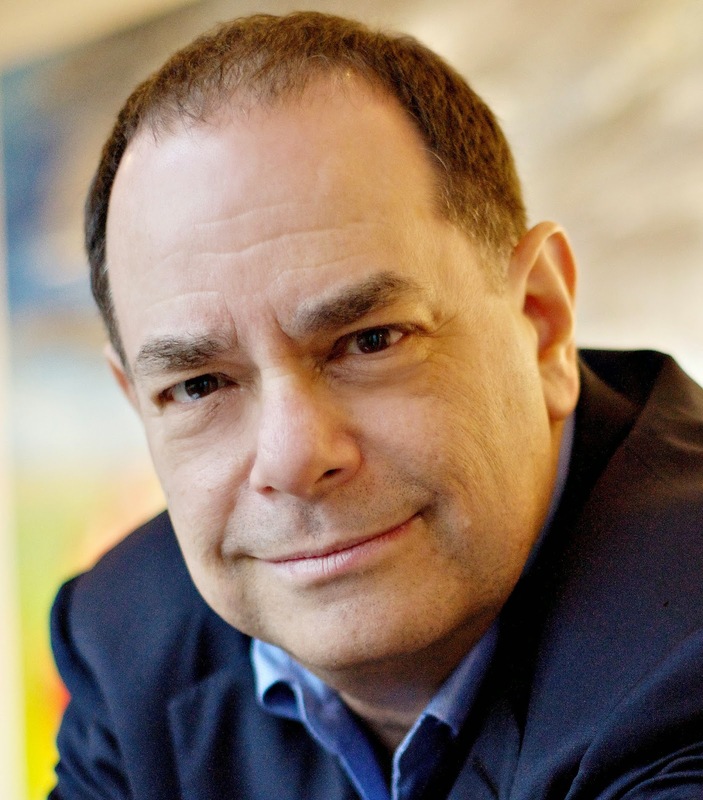 The learning started with keynote Marc Prensky, who coined the phrase "Digital Natives" in 2001. In his talk, Prensky helped the the audience distinguish between "trivial eLearning tasks" like writing online and watching videos to learn; and more meaningful forms of eLearning - the things we weren't able to do before. Things in the latter category included Skype to connect with learners around the world, and WolframAlpha to perform complex computations. And in dealing with the rapid changes of a technological world, Prenske urged the audience to focus on the 'verbs' (presenting, communicating, finding information) which stay the same, rather than the 'nouns' (Powerpoint, email, Wikipedia) which continue to change rapidly. 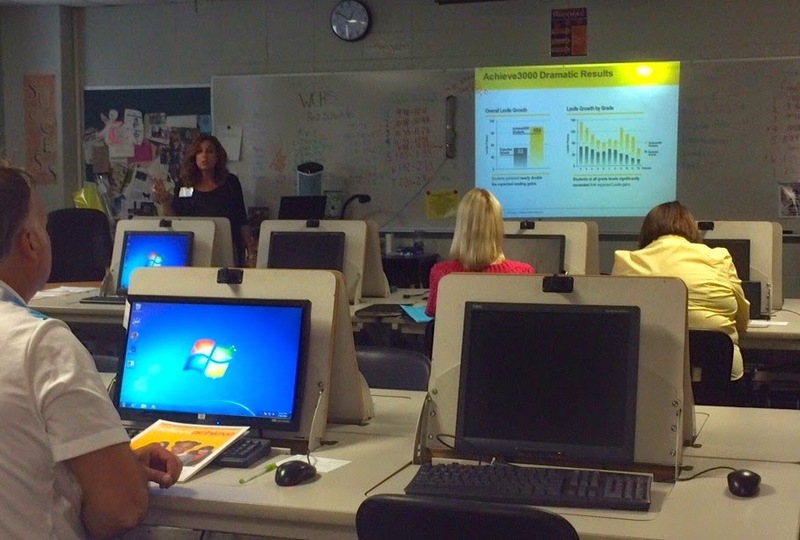 One of the breakout sessions was led by Linda Eleftheri, Media Specialist at Jackson Elementary School. She shared a fantastic collection of digital tools which she curated in this wiki. You'll find a wealth of options to help elementary students express their creativity with sites like Little Bird Tales, or Animoto. If you aren't familiar with these tools, Eleftheri has also posted some great tutorials and student examples under each selection. Students who graduate from Chesterton HS have had great experience writing and revising with the latest Google tools, thanks to teachers like Diana Gill. She demonstrated the impact Google Docs are having on composition, even in terms of making it clear when essays were written and how much revision has been done. For collaborative documents, teachers can also see which contributions were made by which students. Check out some of her favorite Google resources here. Meri started her day learning about Digital Storytelling with Ryan Eckart, principal, and Amy Yoos, instructional coach, from Lincoln Elementary in the School City of Hammond. Their students are using a variety of tools, including PowToon and Windows Movie Maker to create book commercials and book trailers. The book commercials and trailers are shared with individual classes, the entire school through the school announcements, and with their families through YouTube. The students have been working on these during recess, lunch, and before and after school time and they have a waiting list for students to share their book trailers on the announcements. They have even added a blog so that more students can share their favorite books. One thing that Ryan and Amy learned from his students was if you want to leave people really excited about your book, end your trailer with a question. While some of Indiana's schools open their doors to students this week, in other areas the Summer of eLearning is still going strong! 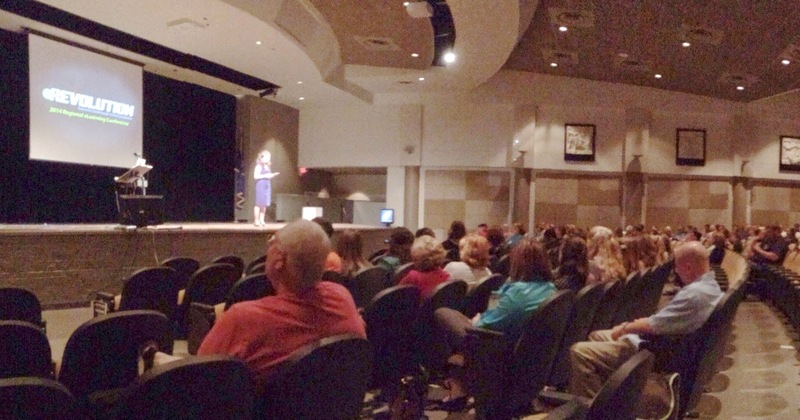 Some 400 educators packed the auditorium today at Warsaw Community High School for another great e3 conference. Their keynote, Angela Maiers took the stage to convince the audience that "You are a genius and the world needs your contribution." Maiers asserts that contributing your gift is a standard of citizenship in the 21st century. To help audience members practice the bravery it takes to contribute, she encouraged every audience member to share a selfie along with their gift - see these tweets and more learning on Twitter at #e3Tech. Candice joined Eric Johnson for his session, Blogging Isn’t Just for 6 yr-olds! Eric shared some of the benefits of blogging: enhancing peer interaction, allowing for synthesis of course content, helping to sustain student engagement, improving critical and reflective thinking, learning becomes…a community. Eric pointed out that all the verbs we are chasing from Bloom’s Taxonomy, ie: analyze, evaluate, create, are present through blogging. 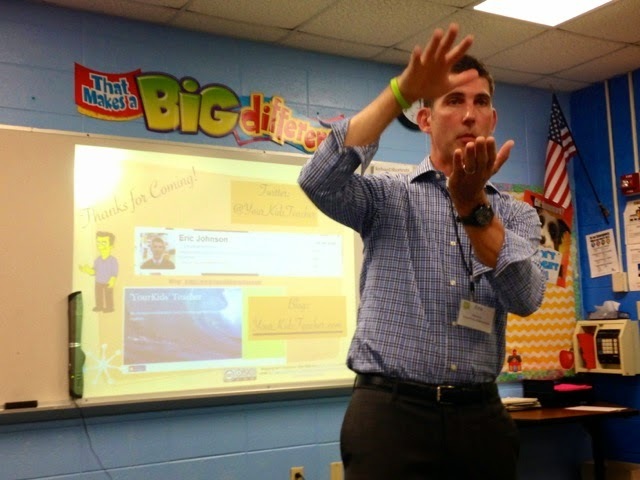 Eric had great step-by-step information on how to get blogging going in the classroom. He uses KidBlog with his students. #Comments4kids is a great hashtag to follow for others educators’ using blogging in the classroom. Follow along to connect with others that empower students’ voice through blogging. “The power and influence of an authentic audience is immeasurable!” Also, be sure to follow along the adventures of Mr. Johnson’s Gnome! 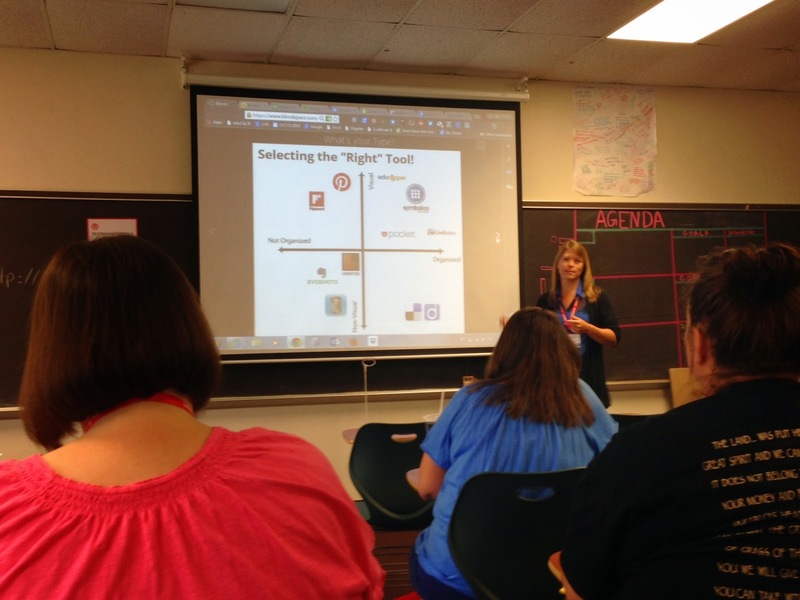 Tara Ulmer is a world history teacher from Southwood High School, and in her session, she shared her passion for powerful primary sources. According to Arne Duncan, we spend 7-9 billion dollars on textbooks nationwide. Ulmer made the point that these textbooks are never our curriculum, and that all good teachers bring in supplements to their content. But with abundant access to primary sources, her current teaching has little need left for the textbook. She taps into resources like the Library of Congress, which among other things, has more than five million maps! Check out their section especially for teachers. It is clear that her class content is a rich tapestry of resources that she has curated to help students learn, and she is eager to share these with her colleagues. Check out Ulmer's guidance document on finding primary sources for some great links to get started. Did you know that our average 12th grader has a lexile level of 910? This is a problem when that same student needs a lexile of 1270 to navigate a student loan application. Diane Baldessari from Achieve3000 led a session about leveling the playing field for our readers, and how their program is gaining results and testimonies all over our state. Some Indiana implementations show students who are using Achieve3000 increase their lexile level at more than 4 times the normal rate. Achieve3000 redefines differentiation by providing text that meets a student at their level. Without being pulled out, students can all read the same content rewritten at various lexiles, and also translated into Spanish. There are still two Summer of eLearning Conferences on the calendar, but we're in Austin, Texas to learn and share some of the new features of our partner My Big Campus at their annual conference. (You may remember last year it was in Indianapolis!) This morning's keynote "What if? Why not?... Oh well" by our own Candice Dodson really set the tone for the first day of My Big Campus' LightSpeed Connect--BRING IT! What's New with MBC seemed like a good place to start our learning. In this session, My Big Campus Developers were on hand to share updates such as the streamlining of templates in creating Schoolwork and the ability to add rubrics at various levels of assignments and assessments. Also in the room was Lightspeed CEO Joel Heinrichs who was interested in attendees' questions. One feature that is still in development is the Gradebook in Schoolwork. Offline Schoolwork is a feature in the new rollout that will allow you to add item to Gradebook without creating an assignment that needs to be completed in MBC. Early September is the expected release date for the Gradebook updates. Also in the works as a result of the previous night's Hackathon is the possibility to give a grade to students' participation in a Group Discussion. There were a number of questions from attendees and the really neat thing about this conference is that you could follow up in the Developers Den or try out new features in the Technology Playground. Bridging the Digital Divide: Getting Technology and Curriculum Departments Working Together This session opened with Joan Roehre, MBC Coach, and Philip Linscott, Senior Systems Analyst for Lightspeed dividing attendees into IT and Curriculum sides of the room. Interestingly enough there was a large group in the center who fill both roles. The facilitators walked the groups through venting concerns. It might be surprising how many Lightspeed and My Big Campus solutions exist in a house united. Lightspeed Filtering in a Google/GAFE World Lightspeed Systems Sales Engineers Nick and Ty addressed how MBC users can selectively allow and block Google services. In the Lightspeed overview they stated that GAFE is a great solutions for schools and that they want to help districts make the most of their implementation. The SSL Decoder was discussed as the primary means for categorizing Google domains and restricting features like Chat if students have access to personal emails in addition to their GAFE accounts. Various access scenarios were described and prescribed solutions. Best practices for allowing YouTube videos in school were shared. Some session attendees expressed dissatisfaction with YouTube for Schools. Nick explained why MBC Library is an effective alternative. Lightspeed filter customers who are not MBC customers do have access to the MBC resource library. Districts that are customers can have their teachers add material to the library anytime; whereas non-customers have to submit materials to MBC Coaches. When a teacher submits a YouTube video to the MBC Library, they immediately receive a direct link that they can use or share with students. Bring Bob Squad to Your School! Two members of Madison Consolidated Schools' Digital Leadership class, Haley Jansen and Hadassah Harris presented this possibility in their session Get to Know the Bob Squad. The girls created an additional group, Bob Squad Information, where you can access a bundle that explains their class activities and work in piloting Bob Squad Junior. The girls shared how they developed the Bob persona as part of their training and walked the participants through similar exercises. If you are interested in starting a Bob Squad in your school or district, start here. Tomorrow, Kris Gordon of Evansville Vanderburgh School Corporation will share Administrative Guide to MBC. Did you get your selfie with a spotlight? 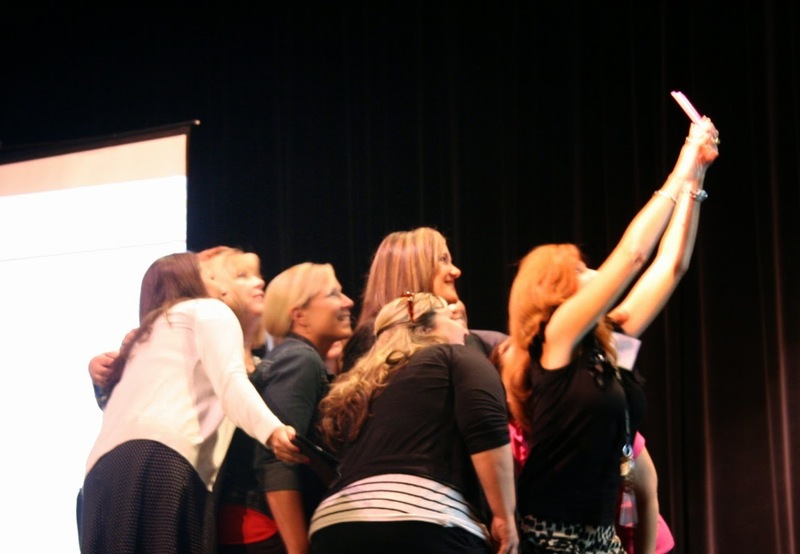 With so many spotlight speakers on the scene at Jeffersonville High School, the hosts of the Greater Clark Connected Conference made them the target of a selfie contest. Tweet your selfie with a spotlight speaker and you could win a fantastic prize! You can check out the selfies and all the learning shared today at #GCCC14. 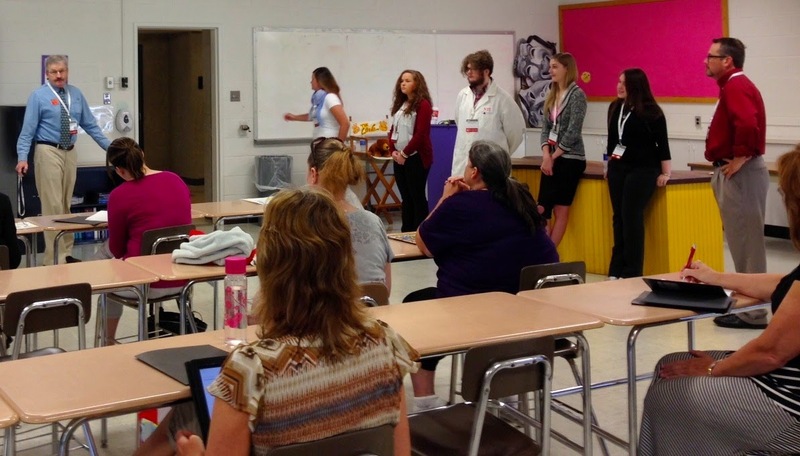 After a welcome by State Superintendent Glenda Ritz, Greater Clark's student crew of 'Chrome Ninjas' took the stage early to model digital teaching and learning for the teachers assembled. These fifth graders talked about how their learning styles demand a new way of teaching. They put together technology-infused American Revolution examples that showcased more engaging ways of learning (Shmoop) and more creative ways of showing what they had learned (PowToon). Keynote speaker, Chris Lehmann (@chrislehmann) shared his passion for "making our schools better, healthier places." Lehmann is the founding principal of Philadelphia's Science Leadership Academy (SLA), which continues to be a great example of what a modern school is capable of being. It is founded on three simple questions that guide their mission: "How do we learn? What can we create? What does it mean to lead?" In a follow-up session, Lehmann shared that the core values of the school are: inquiry, research, collaboration, presentation, and reflection. SLA is also dedicated to an ethic of caring, and has converted their homeroom time into an intentional advisory period to foster amazing relationships with students. Lehmann drew applause from the crowd when he declared that "Before any legislature approves a state test to assess students and schools, those legislators should be made to take the test themselves, and publish their results in the paper." 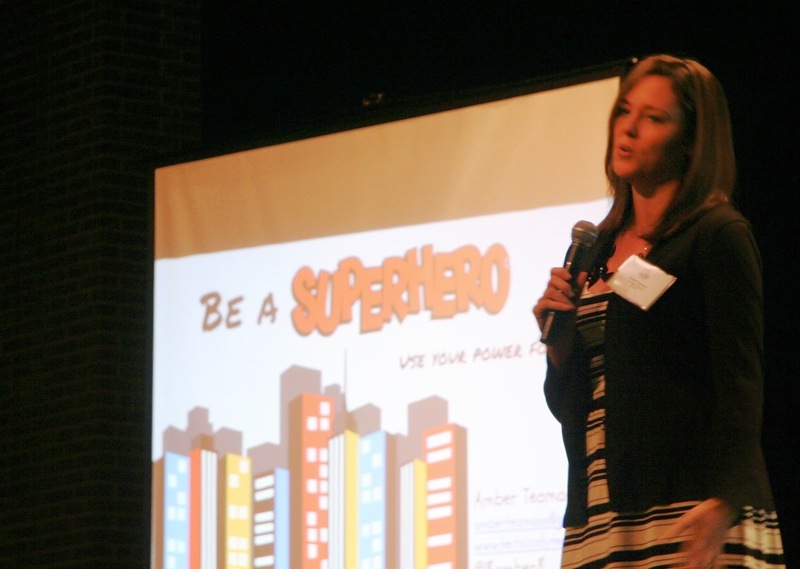 In one of the numerous spotlight sessions, Amber Teaman (@8amber8) urged school leaders to embrace their leadership potential, regardless of their position. Teaman, an elementary assistant principal, has established powerful avenues of communication for her school via Twitter, and has helped families receive important school messages as texts. She also uses her blog to make her vision very clear. One of the management tools she uses to help her multi-task is IFTTT or If This, Then That. This app allows her to automate sharing and posting so that she can literally do 5 things by doing one. Other tools Teaman finds invaluable to her work are Dropbox and Evernote. In the afternoon, Tim Walker from Education Networks of America hosted a virtual session with Dr. Kelly Mendoza from Common Sense Media. Mendoza, presenting from California, encouraged attendees to embrace digital citizenship as a community responsibility. As we have shared before, Common Sense has a wealth of resources to teach students how to build a positive online footprint. This independent, not for profit organization also works hard to rate and map the best apps, games, and websites for the classroom. See these reviews in Graphite. Considering a 1:1 implementation? Be sure to check out their 1:1 Essentials Program for a three phase guide and media-rich resources to help guide your way. 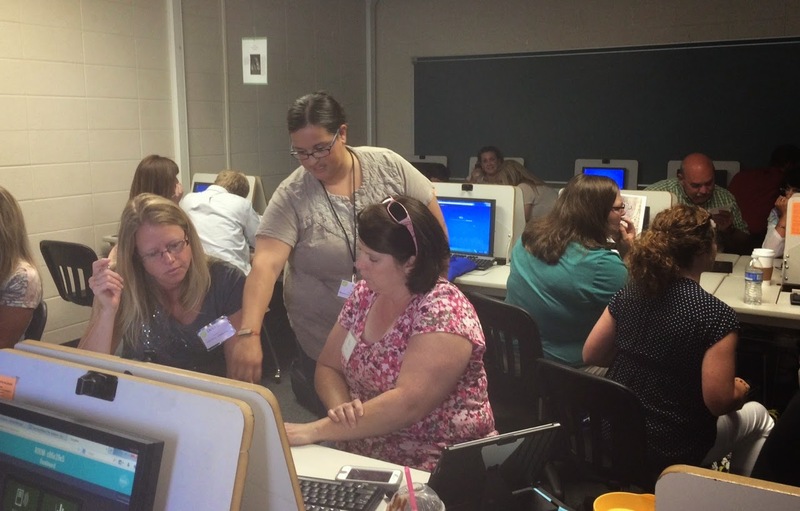 Around 200 people attended the 2014 Richmond Text Expo. 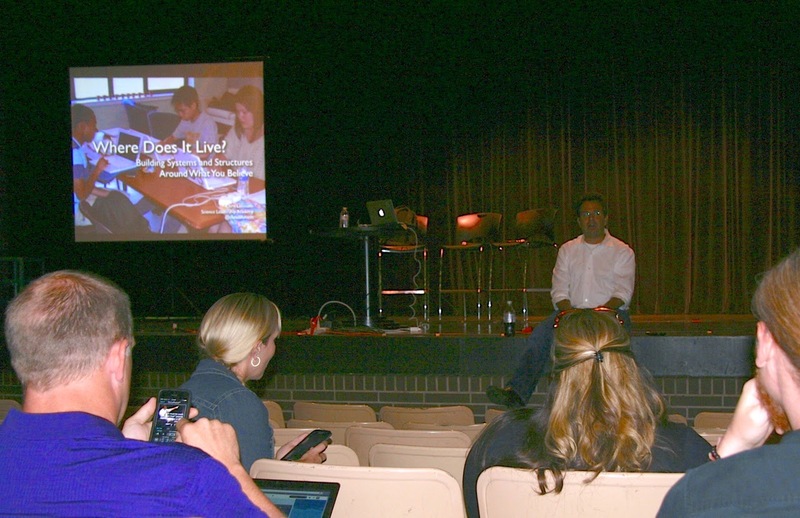 I jumped into the Tech Expo on day 2, so I sadly missed what I'm sure was a wonderful keynote by George Couros. Along with George's keynote, attendees were invited to attend two breakout sessions in the afternoon. Day 2 of the conference offered 4 sessions on a variety of topics. I was familiar with the idea of stop motion animation, but thought it would be fun to learn more so my first stop was Kristin Parker's session. Kristin is an elementary librarian in Hamilton Southeastern Schools who has gotten interested in stop motion. She found of lot of inspiration from Sylvia Libow Martinez and Gary Stager's book, Invent to Learn. (We read Invent to Learn for our eLearning book club this past spring. Visit the eLearning Book Club blog to view our discussion.) Kristin shared a lot of ideas with us, gave us a chance to add to a Padlet she created to share ideas of how stop animation could be used in the classroom, then gave us a chance to try our hands at stop animation. I used the app Stop Motion Studio to create a video of my water bottle traveling across the table. If you're using an Android device Kristin suggested using the app Clayframes. Next I met up with another Hamilton County teacher, Enid Baines from Carmel Clay Schools for her session, Content Curation: Building an Online Library. Carmel is a BYOD district, so Enid is always looking for tools that all of her students will be able to access, no matter what devices they're using. Not sure what curation tool to use? Enid had us take a Curation Personality Quiz. This might give you a place to start, if you're overwhelmed by all of the choices. 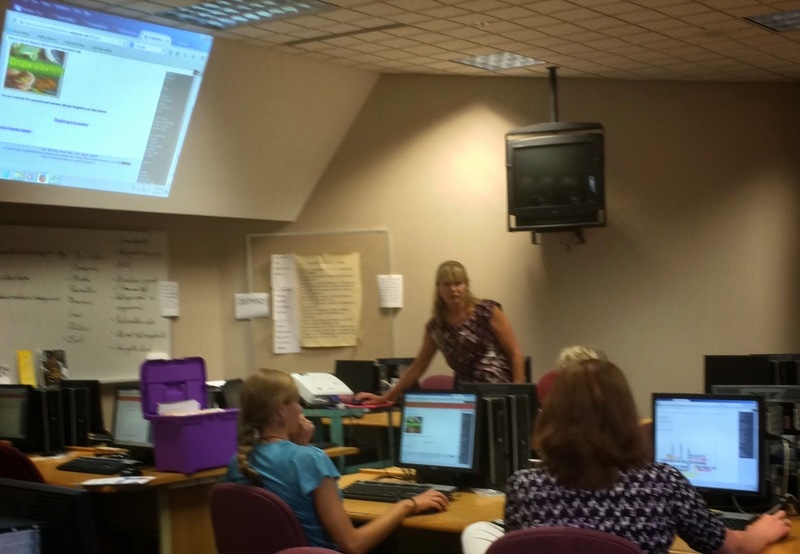 Some of the tools that Enid shared with us were Diigo, Evernote, Symbaloo, LiveBinders, Scoop.it!, and Pinterest. After lunch I took a tour on the "bus to eLearning." We took a 30-minute bus ride and learned from Brian Mowell, Richmond technology staff member, how they are using truly mobile technology and working to extend the classroom beyond the traditional 4 walls. 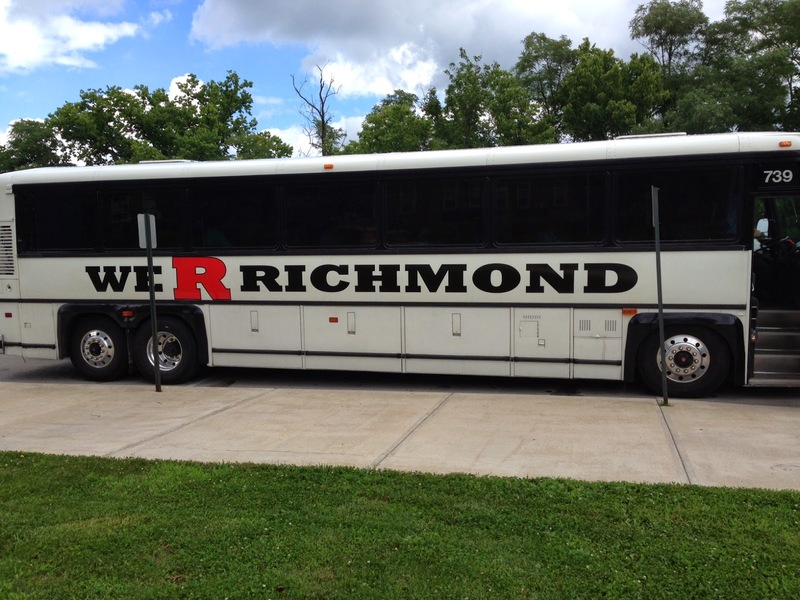 Richmond has a charter bus that they use to transport students for field trips and sporting events that they have outfitted with a hot spot. When they travel the kids can utilize their mobile devices, stay connected and continue learning. The idea of the bus tour was to investigate the ways that we can keep kids connected and learning while on the move...and as a bonus we got to see some of beautiful Richmond! It's hard to believe, but there are only three more stops remaining on the Summer of eLearning tour. Where will we see you? 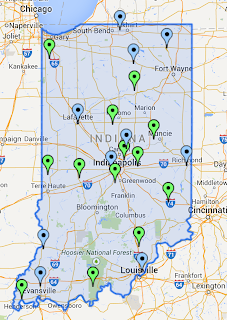 The Summer of eLearning entered its 7th week down in the south west part of our state in Vincennes, Indiana! The eWonderland welcomed 300+ participants for a full two days of learning. Excellent signs and greeters in matching bright green shirts welcomed everyone. Breakfast was provided by ENA- an excellent sponsor and friend of the Summer of eLearning. 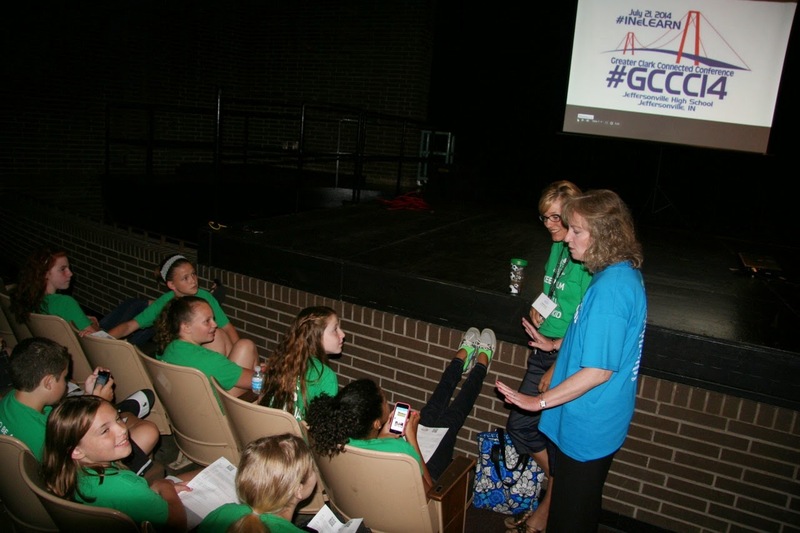 Before the keynote, educators were happy to be welcomed by our own Superintendent of Public Instruction, Glenda Ritz! She shared her love of learning with technology and commended everyone for taking time to come together this summer and learn new ways to engage our students. I spent the morning "falling down the rabbit hole of technology" with Professor Corinne Hoisington@SAMTechNow) in her session, Implementing the Seven Principles of Engagement with Free Technologies. Corinne opened the session with great music and telling everyone, "If you have a device...turn it ON!" Her energy and passion for engaging learning with amazing technology is contagious and the participants were quickly up out of their seats taking pictures and photo bombing each other and exploring Padlet- a great free application for creating and collaborating that encourages engagement between students and teacher too! Next Corinne moved on to the idea of reciprocity with Simplemeet.me a great free website for jumping into a chat with others you invite with a easy code. The Simpleme also lets you upload a file and share that with the group. Corrine next told the group to be ready to get their socks knocked off..when she introduced Thinglink! This application allows you add links to your images and video. Very cool and everyone could think of many ways to use in the classroom. Ever wanted to send a video email to students to really get your information or point across? Try Eyejot.com a free way to send video emails. If you are looking for easy, free tools for engaging students and how to really use them in the classroom- Corrine is a great source. Reach out to her for more information and inspiration! I joined Dr. John Keller(@DRJohn_Keller) in the afternoon to lead a session on leadership in the digital age. Its always a learning experience to work with Dr. Keller- a true change leader in Indiana, and to have the pleasure of meeting administrators around our state. The Summer of eLearning is a great place for teachers and school leaders to come together around relevant topics of discussion and learning. 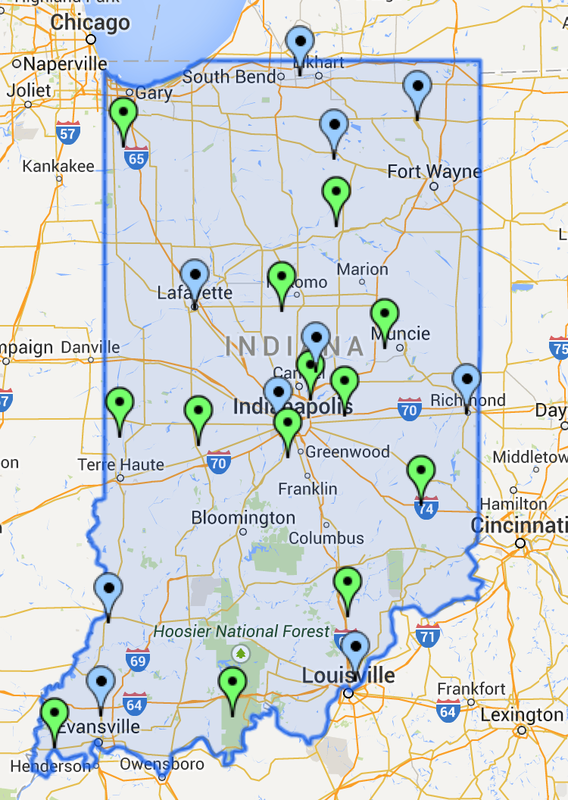 The Summer of eLearning made its southern-most stop this week in Evansville for the eRevolution Conference. With more than 250 sessions, eRev boasted plenty of content-specific presentations and a strong focus on student leadership. 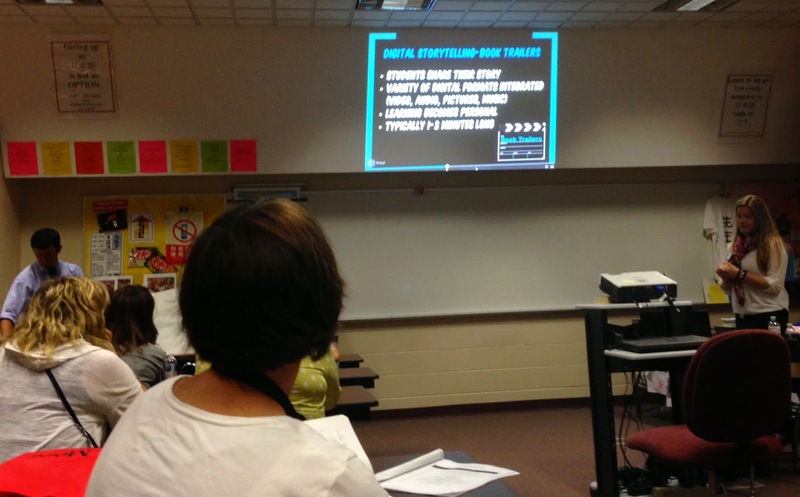 In one of the first sessions, Erinn Jankowski shared how Pinterest inspired her passion for infographics. She used a number of powerful images to demonstrate how adding visuals and color can increase engagement and allow students to absorb information more easily. Among her research, she shared that "people following directions with text and illustrations do 323% better than people following directions without illustrations." Beyond just consuming the graphics, she shared that some classrooms are transitioning to having students create infographics as their own learning process. The experience requires them to analyze data and make complex information easy to understand. She also made a strong argument for why creating powerful data-based presentations is a much more practical skill for our students than the traditional research paper. 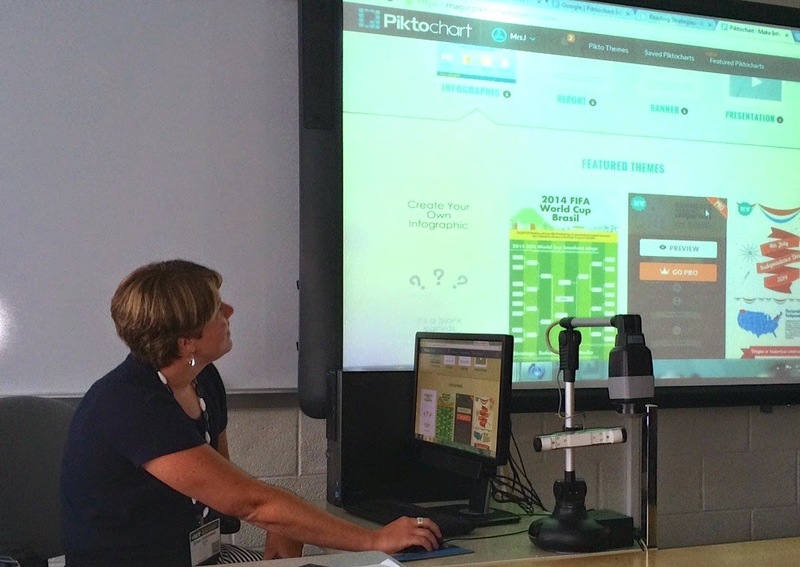 For the hands-on portion, Jankowski guided the group through Piktochart, a free tool her students use to build their infographics. One of the highlights of eRev was the use of student voice. Douglas Johnson, environmental science teacher at New Tech Institute High School (NTI), brought 5 of his students to talk about their project around the driving question: How can we reduce energy consumption at New Tech and lower the cost of energy? Using the EVSC's Conservation for Education Program as a model, the students adopted classrooms at NTI then worked with those classroom teachers to come up with ways to save energy. They then gathered and monitored data using Google Docs and presented their findings. Candice squeezed into a standing room only session with Angela Maiers on Liberating Genius. The participants in this session were administrators from around the EVSC and Indiana! 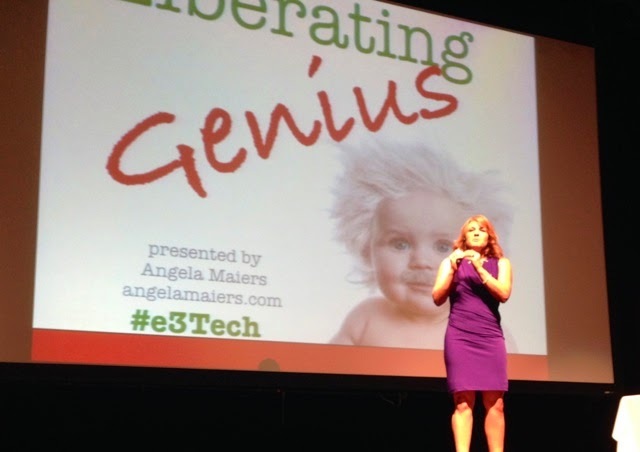 Angela pushed and challenged our thinking to what it means to truly empower and value our students and their genius. What are we doing in our classrooms to unleash the passion and talents of our students? Do you “lead out”? What are your expectations for talents and knowledge to be shared and honored? Genius will not show up if you don’t expect it. Notice It. Value It. Expect It!! eRev's student empowerment theme was anchored by 16 year-old keynote Adora Svitak. The amazingly confident Svitak is an advocate for students to have more say in guiding their own learning. She insisted that the "student/teacher relationship must be a two-way street. We must both be able to teach and learn. We must both be creators of content." She ended by encouraging teachers to take a pledge to honor student voice in their classrooms. C4: Connect, Collect, Collaborate and Create! 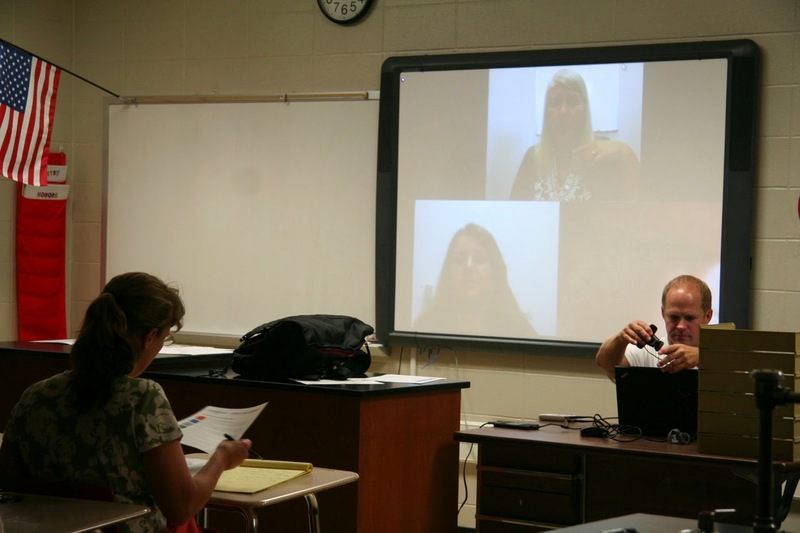 After a trip to Atlanta for #ISTE2014, and a few days off to celebrate America's 238 birthday, we dove back into the Summer of eLearning at Carmel Clay Schools for their C4:Connect, Collect, Collaborate and Create conference(#c4ccs). 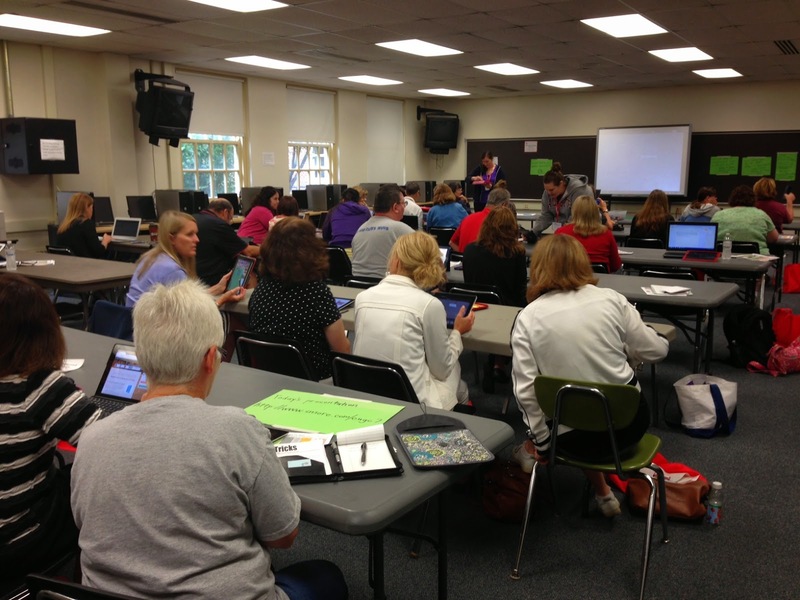 They started the morning with almost twenty breakout sessions over a variety of Edtech topics. I joined Seth Hamilton (@edtechseth) for "Ain't Nobody Got Time for That! ": Building a PLN. Seth shared insights into how Twitter and Pinterest can expand your learning and your connections to other educators. Seth uses TweetDeck to manage his Twitter feed so he can stay up to date but not have Twitter "vampire" his time. Participants liked being able to have private boards on Pinterest that can be shared with a select audience like students or colleagues. Don't forget to follow #INeLearn on both Twitter and Pinterest! Next, a packed lab joined Chris Atkinson (@ChrisLAtkinson) for the "411 on Chrome" during his Chromeapalooza session. Chris is a self proclaimed Google evangelist and a Google Certified Teacher and his expertise and passion for Chrome is contagious! Chris took the group through the many reasons for using Chrome, and some Google vocabulary like Omni Bar which combines your regular address bar and the search box into one area in your browser- very cool. The rest of the session was spent in a flurry of amazing Google Apps like Powtoon, Drive, Hangout Launcher, Kaizena (voice comments), WeVideo (video editor and maker), Pixlr Editor, Feedly, Lucidchart, Stictcher, MoveIt and so much more. For all the 411 from Chris visit his site for his presentation and contact information. Ever Changing World." Denise, media specialist at Prairie Trace Elementary in Carmel, works with all students and teachers in her school to integrate technology to enhance literacy instruction. She utilizes Google Docs, Word, Power Point, Glogster, Excel, Publisher, and her favorite, Pixie. Have you thought about having your students create digital scrapbooks in Google Docs and share them with their parents? What about sharing what your students would do as president in Pixie? These are just a few of the examples that Denise shared. After the morning sessions all 300+ attendees filed in to the auditorium to be awed by Leslie Fisher (@lesliefisher) and her presentation, BYOD: Tools and Implementation. She shared so many great sites and applications that can be used to empower students in their learning. The audience loved joining in the learning and fun with Kahoot and Infuse Learning- both free and a great way to assess learning in an engaging way. By far Leslie's introduction to augmented learning received the most oohs and ahhs from the audience. If you aren't up to speed on this amazing concept- check out all the information from Leslie in this handout. Part of the eLearning team was glad to connect with Leslie and thank her for being part of the wonderful learning happening all over Indiana this summer.